A couple of days ago through social media sites Ray Stevens made the announcement that he's vacated his Grand Avenue recording studio and office after 40 plus years. His CabaRay showroom in West Nashville on River Road opened in January 2018 and construction's been underway on a recording studio at the showroom and in several interviews he mentioned that he'd one day be exiting Grand Avenue for a recording studio at the showroom. Photo's of the new studio's construction also made their way onto social media sites several days ahead of Ray's announcement (on April 11th) that everything's been removed from the Grand Avenue location and it's all been transported the CabaRay. The photo's that were shared of the new studio visually tell us that it'll be awhile before it's up and functioning but it's well on it's way. Those photos were shared on his Facebook page back on April 1st. On April 11th, the day of the announcement, photos accompanied the social media posts. The photos show Ray and friends toasting and celebrating the move from Grand Avenue to the CabaRay. Several of his friends as well as many of his fans offered commentary about the event (myself included) and all of us pretty much share the same feelings. Ray, as far as my research goes, opened up his recording studio in 1974. This happened to be his second recording studio on Music Row...the first one was called The Ray Stevens Sound Laboratory which had a lot of success as a studio for other recording artists to use with Ray acting as it's landlord given he owned the building. Ray recorded at that studio as well but after only a couple of years he moved into the Grand Avenue studio at 1707 in 1974 and he remained there until just this past week. The very first song he recorded at 1707 Grand Avenue was "The Streak". In some of my earliest blog entries I told the story of being in the Ray Stevens fan club at one time. The fan club existed for 15 years, 1987-2002. I became a member in 1994 and I often corresponded with the fan club via letter writing...on an electric typewriter! I'd type up whatever happened to be on my mind concerning Ray's career or his songs and I'd mail the letter to the fan club. I have the 1707 Grand Avenue address burned in my memory banks given all of the letters I'd send off to that address...and nearly every letter was replied to. I'd go to the post office and there would be an envelope from Ray's office in my mailbox...I'd open the envelope and read their reply. Almost all of their replies were on paper with Clyde the Camel as their letterhead. Well, actually, the letterhead was the image of Clyde and the palm trees...which I'm sure all of you are familiar with. Anyway...I was a member of the fan club until it's closing in 2002. I still have many of the newsletters that used to be sent out every month or sometimes once every three months. In some of the newsletters there would be information about upcoming Fan Club breakfasts with Ray. Don't Laugh Now but back then I was an impressionable and naive teenager and so I actually thought that the fans that attended those breakfasts shown up in their night clothes and I thought to myself "oh gosh, I don't think I'd ever want to sit across from Ray Stevens in my pajamas and eat cereal". Don't Laugh Now happens to be the name of Ray's 1982 album on RCA...recorded at the 1707 Grand Avenue studio...a cassette copy of that album shares the camera with myself in the photo above. I have the vinyl album but I decided to snap a photo of the cassette copy. But getting back to my reminisces...the fan club was collectively referred to as F.F.F.O.L. and that acronym stood for French Fried Far Out Legion. If you have Ray's 1993 home video, More Ray Stevens Live!, the performance by the band and Ray's brother, John, kick things off. The band had also been given the French Fried Far Out Legion name. Those of you that have Ray's VHS tapes from the early to late 1990s and even the DVD releases...you're no doubt familiar with the Clyde Records logo and the 1707 Grand Avenue address. The Clyde Records logo was the letterhead that graced a lot of the correspondence I'd receive in the mid to late 1990s. Nearly everything that Ray's recorded since 1974 originated at the 1707 Grand Avenue studio. He's recorded numerous songs that haven't been released yet and those, too, were obviously recorded at that location. I don't think the duet with T.G. Sheppard, "This One Burger King Town", was recorded at Ray's studio. It could have been...but I'm not sure. I'm assuming there will be some sort of announcement when recordings made at the CabaRay studio become available. I think a lot of his fans, myself included, would want to know which songs were among the first recorded at the new studio...just like whatever he releases in the coming months will be among the last recorded at the Grand Avenue studio. Two blog entries in the same day...oh yes...sometimes I may do such a thing! In my previous blog entry I wrote about Ray Stevens and his promotional video clip for It's Starts with M.E. which you can find in the April 2019 archives off to the right hand side of the page. Yesterday evening featured a Ray Stevens mini-bonanza on RFD-TV. It began at 7:30pm Eastern with the airing of That Nashville Music and this was followed by Hee Haw at 8pm. In the Hee Haw episode Ray Stevens guest starred and sang "Shriner's Convention" and "Love Me Longer". This episode originally aired on February 16, 1980 with footage taped in the fall of 1979. The episode had previously aired on RFD-TV last year and it's been uploaded onto YouTube numerous times. It's the first of two appearances by Ray Stevens on Hee Haw in 1980. The second 1980 appearance recently aired for the first time on RFD-TV (February 24, 2019) in which Ray sang "You've Got the Music Inside" and "Night Games". This footage was taped at some point during the summer 1980 taping session and originally aired on October 11, 1980. Preceding the Hee Haw episode last night was That Nashville Music. This was a syndicated country music series that aired for 15 years (1970-1985). On-line information regarding the guests and air-dates is scarce to non-existent but I know Ray made appearances on the show throughout it's lifespan...and last night an episode from 1981 aired on RFD-TV. The series originally began under the title That Good Ol' Nashville Music and was hosted by Dave Dudley. Eventually the series featured a different guest artist each week in the informal role as host/presenter. The episodes were taped at the Grand Ole Opry House and in the episode I seen the off-screen announcer was the legendary Opry announcer, T. Tommy Cutrer. Ray opened the show with "You've Got the Music Inside", performed in the manner in which he had been performing it in his concerts and on television shows of this time period: a blend of uptempo and ballad. The recording of the song, which Ray issued twice (1973 and 1978), were recorded as slow ballads...but Ray obviously decided that the song needed uptempo elements sprinkled throughout so it wouldn't be too long of a ballad for live performances. He performed this arrangement of the song on Pop! Goes the Country, which is where I first seen it, prior to the performances on Hee Haw and That Nashville Music. Leon Everette appeared in the segment following Reba's first performance and his segment baffled me. He's wearing the unzipped black jacket from the cover photo of one of his albums, Hurricane, plus he's wearing a cowboy hat for the performance. The thing that's baffling to me is the actual name of the song. He makes numerous mentions of roses and within the performance he states the phrase "Raining on the Roses" a couple of times during what appears to be song's chorus and so I'm assuming "Raining on the Roses" to be the name of this song...but yet no song with that title appears on any of the studio albums released on Leon Everette during the years of 1977 through 1981. I've already looked up his studio albums on eBay and gone over the track lists of those albums. Unless this song appeared on some obscure collection of songs that hasn't appeared on-line yet, was never recorded but only performed for this appearance, or whether I've got the song's title wrong hopefully someone out there will have some recall of the recording I'm baffled over. Now, when I was watching Leon's stage presence, he reminded me of Conway Twitty and Gene Watson...not vocally, of course, but the manner in which those two presented themselves on stage seemed to have heavily influenced Leon's performing style. Leon, at the time, was a label mate of Ray. The two were on the RCA roster in 1981. Reba, on the other hand, had been on Mercury for a number of years...Jerry Kennedy would produce a lot of her earlier recordings...and eventually she would have Norro Wilson as a producer for several of her recordings...and those two men were a couple of legendary figures with connections to Ray Stevens. Ray sang "Marie" prior to Reba's second performance...mentioning Randy Newman as it's writer. I'd never heard the song before and so this performance from Ray was brand new to me. As mentioned, Reba and Susi performed "Today All Over Again", and this was followed by a brief clogging routine. Ray closed the show with a song whose title is, I think, "Everybody is a Clown Inside", which I've not been able to find any information about. One of the band members dressed up as a hobo clown (in the tradition of Emmett Kelly) and pantomimed/acted to Ray's performance. As far as Ray's attire...for those that like to know these things...when he opened the show he was seated at the piano. The button-up shirt he was wearing was sort of light blue...it had some embroidery on it similar to the design that appears on the black shirt he's wearing on the 1983 Greatest Hits album on RCA. The remainder of the episode featured Ray wearing a brown jacket/suit...it might be the same one worn during an appearance he made on Barbara Mandrell's television show in 1981. As of this writing the 1981 episode of That Nashville Music hasn't been uploaded onto any social media video page and so I'm not able to embed the episode. A video of the episode exists on RFD-TV's subscription service, Country Club, though. You can visit that page by clicking HERE. Ray Stevens: It Starts with M.E. Hello once again...in this first fan created blog entry of the month I'm going to highlight a recent YouTube video clip that emerged from Ray Stevens last week (April 5, 2019). The video promotes music education and how emotionally beneficial it can be to a person's life. In researching the project I found out that It Starts with M.E. got underway in the latter half of 2018 following the CMA Music Fest telecast on ABC-TV in August of 2018. In the years leading up to the creation of this program there had been similar kinds of programs/seminars devoted to enriching one's life with music but based on my research It Starts with M.E. is a culmination of those similar awareness programs all rolled into one. Ray has, down through the years, participated in a number of seminars and programs promoting music awareness in addition to sitting on panels discussing songwriting and the intricacies of music and it's impact on people's lives and so from that aspect this isn't new territory for Ray to cover but given the clever slogan and the fact it's being widely publicized beyond Music Row gives the CMA Foundation's campaign a bit more broader attention rather than it coming off as something exclusive to those that work in, or routinely visit, downtown Nashville. The reason for the unique spelling, in case you hadn't figured it out by now, M.E. stands for music education. I'm a big fan of what's called classic country music. I love the HEE-HAW television program and I like watching vintage cartoons. I have several blogs...the main one is devoted to Ray Stevens. My Ray Stevens blog is written from a fan's perspective. The opinions and expressions discussed in this blog are of my own creation and should not be taken as representation of Ray Stevens and his office staff. I'm simply a dedicated, though opinionated, fan of Ray's who likes discussing his music and career. This fan-created blog page is something that I started when I got fed up with the lack of accurate information about Ray Stevens that was circulating on the internet. Spam or off-topic comments will never be published. The first release on Ray Stevens arrived in 1957 on the Prep label, a subsidiary of Capitol Records; "Silver Bracelet" is a love ballad in a style that mirrored teenage pop music of the era; Ray would also embrace the sounds of Rhythm and Blues and incorporate a lot of that style into recordings made throughout the first chapter in his career; Ray gravitated toward country music in the 1970s while simultaneously charting pop and Adult-Contemporary, sporadically, the same decade; By the mid 1980s onward Ray has more famously been marketed or presented as a comic/country comedian although he continues to showcase his serious side in concert performance and on records. 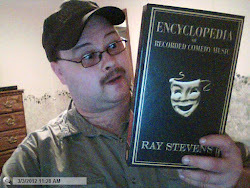 The Encyclopedia of Recorded Comedy Music became available on February 28th; It's an impressive set featuring 9-CD's and a booklet; There are 108 recordings altogether and the booklet gives in-depth detail about each of the songs and their impact on society; Ray covers practically all the major comedy/novelty songs that have been recorded over the last 60 plus years; It's a marvelous collection!! Ray's memoir, Nashville, is a great book! If you don't have a copy I suggest you purchase one...any fan of Ray Stevens should get this book. Ray's recording, "Dear America", demonstrates that America is still the greatest country on Earth regardless of internal conflicts and imperfections; A loving tribute to the country and a defiant plea that the country's values and traditions should still continue to be championed and fought for; Excellent recording! Season One DVD of Ray's television series; It contains the first 13 episodes broadcast on local PBS stations from earlier this year; These episodes originally aired on RFD-TV but they were repeated on PBS stations starting this past January; Some local PBS stations aired all 26 episodes from the RFD run while other local PBS stations aired the first 13 episodes and then began airing the PBS exclusives which became available over the summer months; Future DVD releases are expected. Season Two of the Ray Stevens CabaRay Nashville series; This volume consists of episodes guest starring the likes of Bill Anderson, Con Hunley, Williams and Ree, Leroy Van Dyke, and many more!! A perfect companion to Season One; Each season contains 13 half hour episodes. The Ray Stevens CabaRay Showroom officially opened to the public on January 18, 2018; The facility houses an entire array of entertainment from the main showroom to a piano bar, a gift shop, and it also houses his recording studios for audio and video productions; The upcoming Sixth Season of his PBS television series, CabaRay Nashville, is being taped at the showroom; These episodes represent the first to be taped at the venue. Ray Stevens receives his star on the Music City Walk of Fame in downtown Nashville; The ceremony took place on August 21, 2018. On March 18, 2019 it was announced by Nashville radio personality Bill Cody that Ray Stevens was elected to the Country Music Hall of Fame; The Class of 2019 inductee's also include Jerry Bradley as well as Brooks and Dunn; Ray's election to the CMHOF, as far as I'm concerned, was long overdue but finally it has happened; Ray Stevens has a unique career in that he's a singer-songwriter but he's also a musician, a producer, an arranger, a music publisher, and music video mogul; I, in my own way, have long championed the election of Ray Stevens into the Country Music Hall of Fame and to say I was thrilled when the announcement arrived on March 18th is an understatment...I was ecstatic, thrilled, shocked, and anyother kind of positive emotion you can think of; Ray's formal induction will take place in a couple of months at the Medallion Ceremony.